On my first night in Iran, I walked through the dark streets of Kashan, a city unknown to me, with Mohammad, a guy I’d met on the bus from Tehran. It was nearly midnight, and we were headed for a mosque. Suddenly I wondered: Is this really a good idea? Which happens to be the same question my wife asked me before I’d left Minnesota. I reminded myself of what I’d told her. Iran is one of the safest countries in the Middle East, with no recent hostage taking, no suicide bombers, no random knife attacks. Iranians like Americans. Millions of tourists visit the country every year — just not many Americans — for ancient architecture; spectacular scenery ranging from snow-capped mountains to sun-baked deserts; distinctive flavorful cuisine, and the legendary hospitality of its people. I had visited briefly 15 years ago and was fascinated by what I experienced. This time, I wanted to get to know the Iranian people better. Mohammad, it turned out, was a soldier on furlough, on his way to visit family in a nearby town. Having never before met an American, he was eager to talk. It was the holy month of Ramadan, during which Muslims abstain from eating and drinking from dawn to dusk, and this was an especially holy night, he said. It was the anniversary of the martyrdom of Imam Ali, successor to the prophet Mohammed. Shia Muslims, he explained, believe that on this night, God decides what your fate will be in the coming year. 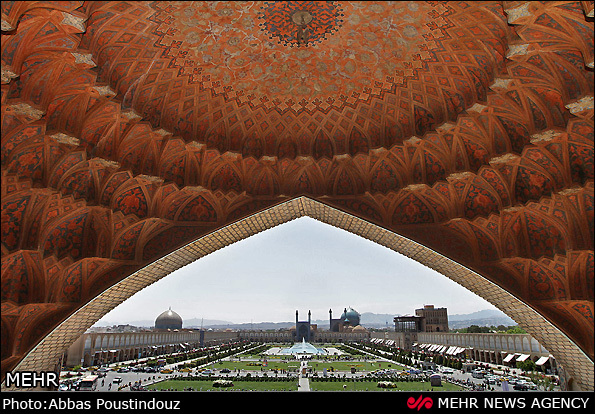 Nasir al-Mulk Mosque in Shiraz, Iran, dazzles with its many hues. Young men in black swarmed the mosque. Some gathered near a big water tank, quenching their thirst after nearly 16 hours without food or water. One man’s scalp had bloody scars. Mohammad explained that he had cut himself to express his grief over the death of Ali, though even the Supreme Leader has denounced this practice. The few women there were mostly shrouded in black chadors. We stuffed our shoes into plastic bags, entered the enormous dark sanctuary and sat cross-legged on the floor. Hundreds of men chanted prayers in Arabic. They would continue for many hours, long after Mohammad and I left. As we made our way back to Ehsan House, a traditional guesthouse with a courtyard centered, Mohammad asked me about my religion. I’m not much of a believer, I told him. And then he unburdened himself. He isn’t much of a believer, either. He reads forbidden books. He thinks religious devotees are superstitious and ignorant. These ideas, he said, are not something he can talk about freely; even his family must never know. The next morning, I wandered Kashan with a Chinese tourist and discovered the eerie emptiness of a ghost town. In observance of Ali’s martyrdom, everything was closed. A day later, and 136 miles away, I was in a different city, and what felt like a different century. Isfahan is one of the most beautiful cities I have ever seen, with domed mosques, ancient palaces and parks that seem to go on for miles. Among the city’s bridges, I was especially enchanted by the double-decker, barrel-vaulted Khaju Bridge, whose archways glowed golden against the blackness at night. In this ancient city, my hosts were three sisters, nieces of a friend of mine from Minneapolis who spoiled me with their hospitality. They took me to see the Shah mosque, a blue-tiled masterpiece on the city’s expansive Naghsh-e Jahan Square. We went to Hasht Behesht palace, a mansion that dates to the late 1600s; the Armenian cathedral, whose lush interior is covered in frescoes; and the Jewish Passage, an arcade of Jewish-owned shops where we chatted with a haberdasher. Business is down, he told us, but would improve if the United States and Iran resolved their differences. He occasionally hears prejudiced remarks from ignorant people, but not from educated Iranians. And though he has visited Israel three times, he does not want to emigrate. My companions, I learned as we drove around the city, don’t share his reluctance to leave. They have little regard for the cleric-dominated government and hate the religious restrictions that affect their lives, such as a requirement to wear the hijab. Like other Iranians I met, they were eager — and unafraid — to talk freely. After the sun set, my guides took me to Isfahan City Center, the largest shopping mall in Iran. This confection of marble and glass houses high-end boutiques and a Hyperstar, a SuperTarget-sized store where shoppers can buy anything from giant LG flat-screen TVs to athletic shoes. On the top floor of the mall, an upscale food court offers fare ranging from koubideh (skewers of fire-roasted seasoned meat) to pizza and burgers. At the entrance to the Hyperstar store, an illustrated sign admonishes women, in Farsi and English, to “please respect hijab.” In the illustration, the woman’s hair is completely covered. But in the megamall crowded with shoppers, nearly every headscarf is pulled back, sometimes a lot. So, which is the real Iran? Is it a theocracy, or a high-tech consumer society? Actually, it’s a bit of both. My experience was limited, but by most accounts, the theocracy is losing ground. One man I talked to summed up what seems to be a common attitude: Change would have to come slowly, and couldn’t be forced on the country. Many Iranians want change, but not turmoil; they appreciate that Iran is an island of stability and prosperity in a turbulent region. An old Iranian joke says, “Before the revolution, we drank in public, and prayed in private. Now we pray in public and drink in private.” I’m told that fewer people are praying and more are drinking. And sometimes they exist in the same household, as I discovered in the next city I visited. I chose vodka, and he poured a shot of clear spirits from an Old Grand-Dad bourbon bottle. His wife had been fasting all day, but he had not. “Where did you get it?” I asked. Shiraz can’t match the beauty of Isfahan, but it too has pleasures to offer, beyond vodka. At an unmarked hamam, a wizened masseur rubbed me down with a gritty cloth that removed the grime of my voyage and several layers of skin. I passed a few moments of quiet contemplation at the grave of the poet Hafiz. I got a haircut from a bemused young barber. Early one morning, my host and a friend drove me to the ruins of Persepolis, built more than 2,500 years ago by King Darius the Great. We paused outside the gates for breakfast and were surrounded by other ruins: the remains of a once vast and luxurious tent city, erected in 1971 by Mohammed Shah Pahlavi, the last Shah of Iran. Where the world’s monarchs and dignitaries celebrated that 2,500th anniversary by drinking Dom Perignon Champagne and feasting on roasted peacocks is today a weedy field with skeletal frames, stripped bare by scavengers. Inside the gates, the Persepolis ruins are magnificent, revealing a palace complex on a gargantuan scale, with massive stairways and carved columns, statues and friezes. It is one of the world’s great archaeological sites. Kings and rules have come and gone, but Persepolis is a silent reminder that when trying to understand one of the world’s great civilizations, it helps to take the long view. Jeremy Iggers manages GlobalTwinCities.com, a multicultural calendar and directory of area events, organizations and businesses. This article was written by Jeremy Iggers on Oct 07, 2016 for Star Tribune.